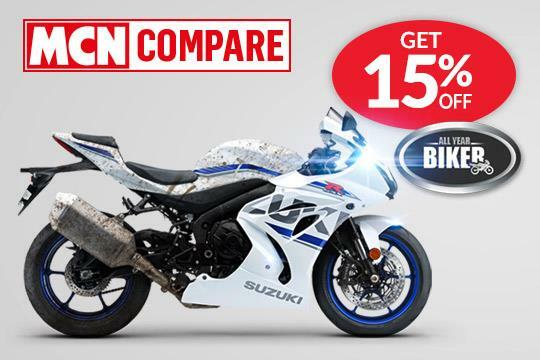 MCN Compare have teamed up with All Year Biker this winter, and we’re offering an exclusive 15% off the standard treatment for your motorcycle when you get a bike insurance quote with us. This is the first time All Year Biker have offered a discount like this and it's for a limited time only, exclusive to MCN Compare. It’s our way of helping you protect your bike throughout the colder months. Get your quote now! That’s great but what is All Year Biker exactly? All Year Biker have pioneered a treatment system for motorbikes that goes way beyond a simple wash and polish, and further protects your machine from road salt and grit that can lead to corrosion and hinder performance. Using their own-brand cleaning products and techniques they prepare your bike with a deep clean before coating it with advanced corrosion protection that will keep your bike shiny and defend against the elements for up to 12 months. This offer is valid for a limited time only, so why wait? Get your quote now! The list of current All Year Biker operators is displayed on their website ‘Booking’ page: www.allyearbiker.co.uk/booking/. Customers can select the operator they wish to go to from the Booking Map and click on the icon to bring up that operators direct telephone and email details. The operator will then arrange the treatment appointment date and time either during the telephone conversation or by email shortly afterwards. On arrival for treatment the Customers must produce evidence they are eligible for the promotional discount by providing to the operator either a printed copy or electronic version of the insurance quotation. Bookings to be made by customer within 30 days of the date of the quotation. The actual treatment appointment date will be confirmed by the All Year Biker operator and may be outside of that 30 day period subject to workload and availability. The offer is limited to the recipient of the quotation and to one motorbike being the registration shown on the quotation. All Year Biker currently offer two anti-corrosion treatment options, the standard ACF-50 and XCP Rust Blocker, the XCP option being at a higher price. The promotional discount will only apply only to the ACF-50 treatment option. Bookings would be made at All Year Bikers operators operating base and exclude ‘Home Visits’ and ‘Venues’ or ‘Events’ as these incur additional costs to the operator and would not therefore be viable under the promotional offer discounted treatment price. All Year Biker standard Ts & Cs apply to all bookings made under this promotion. The nature of motorbiking and the treatment process mean they are sometimes subject to weather conditions, high wind, heavy rain, snow, ice etc., and occasionally equipment failure. If this occurs the motorbike rider may not turn up or the operator might cancel the appointment. Our operators will do their best to contact the customer to advise and arrange an alternative appointment. All Year Biker operators also reserve the right to decline a booking or treatment if in their opinion the motorbike is unsuitable for treatment. Get bike insurance quote now to receive your discount. Happy 10th birthday MCN Compare!